Lets do some upgrades to our LCD package. I think the best way to do so is to write a simple game. We will use both screens to display game objects, on one there will be flying DMO (defined moving object :D), and on second lcd – a player. Enemy and player will be trying to hit each other with bullets. Simple concept but exactly what we need. Source available at the bottom of this post. I will use two screens from previous tutorials. Enemy will get bigger lcd (20×4) because.. hmm just like that. And player will move on smaller one (16×2). Bigger screen will go on top, smaller on bottom. Basic time unit is tick, defined as 1 second. Main loop will do its job, refresh displays and sleep for the remaining time (to 1 s). All object will be stored in array and on each tick they will be called and redraw. DMO will move randomly in horizontal direction by 1. Will also randomly drop a bomb. Player will be moving horizontal and firing according to user actions. First we will play with keyboard control. When enemy is hit it will explode and another one will respawn. When player is hit the game ends. Download code from previous post, unzip and start your favorite IDE. We will focus on using and rewriting LCD package. Create game package piader – there we will store game files. Lets begin with basic things. Main loop, moving enemy and game launcher. 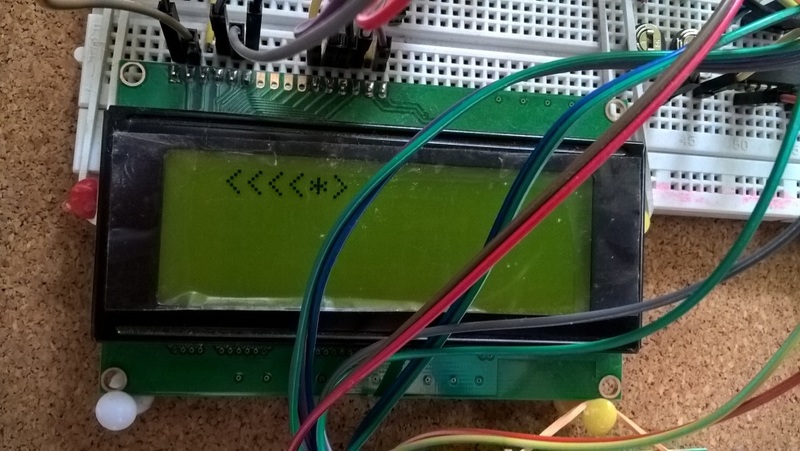 """set lcds and start game"""
Function __init__ is receiving array with lcds. They will be used to display game. Its initing them and creating first object/item – our enemy. We define game size as 20×6 and tick as 1 second. After init sequence launcher will run a main game loop, called game. For now its calling tick function and sleeps for required time, as long as needed to keep with 1 fps. Function tick is responsible for all actions. It will iterate over self.objects, call tick on each item and do drawing. Array self.objects will keep all items that do some actions, like enemy, player, bullet, bomb. All objects in our game have coords (x, y), we need to know where they are, and sprite, we need to know how they look alike. We need to have an access to those parameters, so few functions are required. Another required function is tick called from main loop. This function is responsible for object AI. Objects will be created with start coordinates and maximum allowed width. So no object will move out of screen range. """DMO - defined moving object"""
Our enemy has simple sprite and simple AI. It will move randomly left or right by 1 field. When you run the launcher, you will see (probably) a nice DMO moving randomly. But there is a big problem. Lcd is not clearing itself ! Our game is only drawing object but not clearing previous state. And there is this big blinking cursor. Actually we have two problems. First it will be good idea to add some init parameters to lcd driver. We will be able to set some options like hide a cursor. Second problem is more complicated. We can manually clear old DMO position and redraw it on new one but its very ineffective. Better idea is to add buffer to our lcd driver. Lcd will know what is currently displayed on it, we will store this information in array. Next we wont write anything directly to this array. We will create another array that will be our buffer and all drawing will go to it. After we are ready we will tell driver to update current display from buffer. It will do this a clever way, writing only those chars that differ from current one. Its good idea for performance. Its rare to change all chars on all displays at the same time. By doing write operations only when needed we greatly increase performance. Imagine, we have two screens, 20*4 + 16*2, it gives 112 write operations for all chars. But our DMO require only four ! One to clear old part, ant three to display it. We wont delete our old way of accessing lcd but we will rename it as direct. New one will be called buffered. If we look at the documentation of HD44780 we will find that command Display ON/OFF is responsible for setting cursor options. We have two options blink and display. Lets use them. First add new test in test_lcd.py. I wont digg into testing. This time I’m mentioning about it because its good practice and I’m using TDD approach (only for project package, not Piader). If you want to see all tests look into source code. And we are green. Now change lcd creation in launcher by adding parameters to turn off cursor and blinking. Thats more complicated. 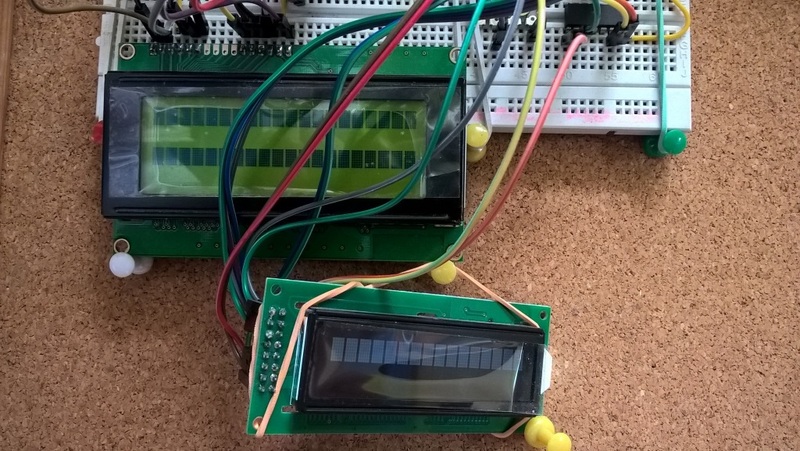 We have two ways of displaying on lcd that are totally different. Lets see if we can split them into two classes with current lcd as parent class. All function that do writing we will move to lcd_direct.py and whats left is common part of two new classes – and it will stay in lcd. After that we have all write functions. 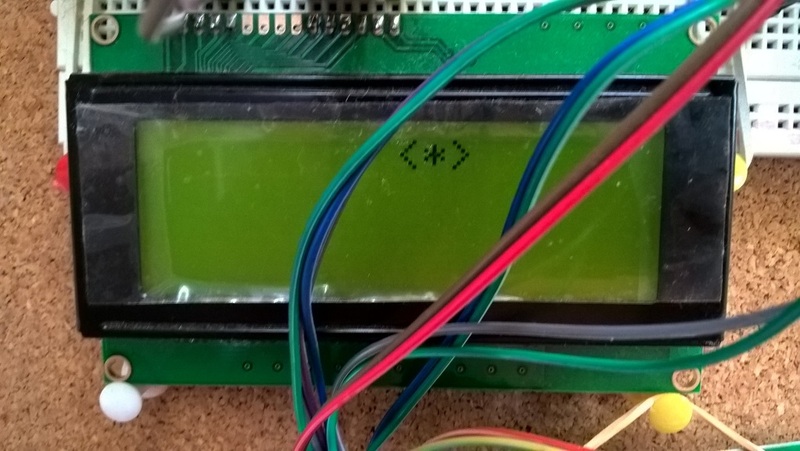 So our lcd.py is left with __init__ and 5 other functions. One last thing to change, launcher, change lcd to lcd_direct. Nice or not ? Run tests… yep they will fail. Time has come for main part. Lets think for a second. What we need is ability to prepare our buffer and when its ready flush it on main screen. Flushing must be clever, just write chars on positions that differ. We should be able to put char or string at any position and it would be nice to use stream mode. Without coordinates chars will appear one after another. So we need to calculate current position and store it. """Lcd class for buffered input"""
"""screen init and buffer init"""
"""writes content into buffer at position(x,y) or current"""
"""Flush buffer to screen, skips chars that didn't change"""
Few words about it. We iterate on three things at the same time, line number, line in buffer and line in current. If buffer and current line are different we iterate over chars on each line. If chars are the same, we increase internal pointer. If chars are different we check if we are in required position and if not we move lcd cursor, and then we send char to lcd. Last thing to do is update screen line with buffer line. Change our launcher, replace all lcd_direct with lcd_buffered. Modified tick function clears buffer, enters loop and flushes buffer. In draw function we write to buffer. Small changes and we are ready. Now start script and you will see DMO moving randomly – this time without leaving traces. We have some stable source of our game. Its good idea to run Jenkins test. As I mentioned I wrote required tests. They are in source package. Stay tuned for next part.